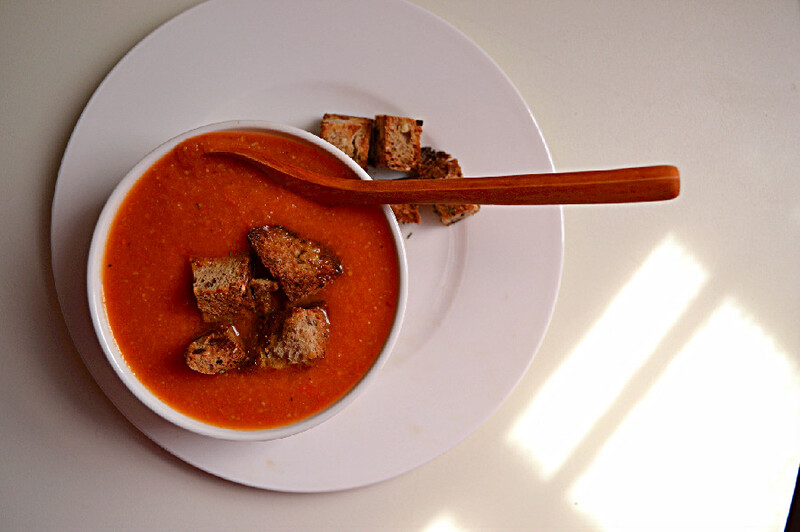 It seems a little counter intuitive to be posting a soup recipe when the weather is scorching hot in Milan today, but then again, it must be cool somewhere out there, and soup is always a great meal option in my opinion. Besides, this was just too good to hold back from you. We visit my in laws in Tuscany about once a month. My husband was born and raised in the beautiful town of Arezzo and his parents live in the countryside just outside the city center. Every time we go there I’m so mesmerized by the beauty of the landscape and the historic city center, yet they seem immune to it, having all been born and raised there. On our last visit, we had lunch in a very small and characteristic spot in the center of Arezzo on Easter Monday (known as Pasquetta or little Easter in Italian). The menu was largely made up of a gazillion types of bruschette, regional soups, vegetable sides and lots of organ meat dishes that not even the meat eaters were into. So, it turned into a mostly plant based lunch for all. Hubby and I had bruschette and soups. He had Pappa al Pomodoro, a typical Tuscan bread and tomato soup and I had Ribollita, a white bean, kale and bread soup, also typical of Tuscany, both of which I will eventually get around to making and sharing in this space one day. For now, it’s sort of a hybrid, a Creamy Tomato & Cannellini Bean Soup, and it’s oh so delicious. Mamma, sent us home with a container of organic cherry tomatoes on Monday night, among other things, and since we hadn’t been home to do the grocery shopping over the weekend, Tuesday night’s dinner had to be a pantry meal using those tomatoes. I didn’t have time to soak my cannellini beans so I used my emergency stash of beans in a jar. I try to soak and cook dried beans as much as possible but for times when that’s just not in the cards, I use the ones in glass jars, and I avoid metal cans with plastic inner linings as much as I can. 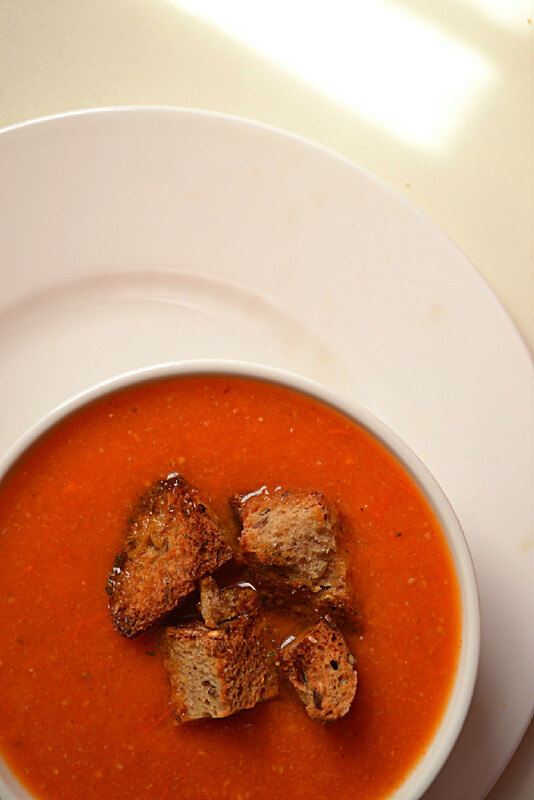 So, inspired by our lunch in Tuscany, the container of cherry tomatoes and the contents of my pantry, I created this deliciously creamy soup, satisfying enough to make a meal and light enough for a late weeknight dinner. Nutrition 101: The Good, The Bad and the Deadly? You may or may not have noticed that I don’t have a lot of tomato recipes on my blog, and for very good reason, which I’ll explain in a few minutes. It’s sort of a love hate relationship. First, let me just say just how much I LOVE tomatoes, especially when they’re perfectly ripe and sweet and at room temperature, sliced in half and eaten with a sprinkle of fine sea salt and fresh ground black pepper, not to mention a good tomato sauce for pasta al pomodoro or salsa and corn chips. Tomatoes are rich in Lycopene, a phytochemical with potent anti cancerous properties that is available in raw tomatoes but more so in cooked tomatoes, specifically the red variety (not the green or yellow ones). They are also an excellent source of Vitamin C and K, biotin, molybdenum, potassium and many other vitamins and minerals and have been shown to offer protection against infection, digestive disorders, acute appendicitis, and high blood pressure. Tomatoes, specifically fresh ones, have also been shown to lower blood cholesterol, prevent blood aggregation and lower the risk of atherosclerosis. So far, all good news, right? Yep, but here’s where the bad news comes in. Tomatoes are part of the Nightshade family of plants which includes eggplant, potatoes (not sweet potatoes or yams though), peppers and even tobacco. Nightshade vegetables contain high levels of glycoalkaloids which have been shown to be toxic at high levels, hence the term Deadly Nightshades to refer to this group of plants also known as the Solanaceae family. Another issue with Nightshades is that they disrupt the metabolism of calcium. So, for those who don’t consume dairy products and/or have arthritis, they are best avoided or limited to some degree. This is where my love hate relationship with tomatoes comes in. I love them, but they apparently hate me. I’ve had a very mild case of psoriasis for most of my life, since my very early teens. A few years ago, it developed into a case of psoriatic arthritis with swelling and discomfort in some fingers, following my move to Italy and let’s just say record consumption of tomatoes in that time. On the advice of a macrobiotic counsellor, I gave up dairy and significantly reduced my intake of the Nightshades and have seen huge improvements ever since. Given my love of tomatoes and babaghanoush, it’s been a struggle to stay away from the Nightshades. Potatoes and peppers have been less of a problem and I can go months without eating them, I can also avoid eggplant until the season comes, but it’s hard to ignore a tomato when you live in Italy. The season officially runs from May to September, but they are available year round, and delicious even out of season – #italiansdoitbest. I try to limit my consumption of tomatoes in the off season and really do notice more joint stiffness when I overdo it, but as long as I keep it to a minimum, once a week doesn’t seem to bother me at all. It’s all about balance in the end, the #harmonyalacarte way. Update: I’ve adjusted the amount of water in the recipe because some tomatoes naturally have more water content than others. It’s better to add less water to start and adjust later as required based on how much liquid your tomatoes produce and your personal preference for how thick/thin you like the soup. Saute diced onions in water or extra virgin olive oil and Herbamare until translucent, about 3 minutes. Add garlic, if using, and sautee for an additional 2 minutes. Add cherry tomato halves, oregano and chili flakes and continue to sautee for an additional 5 minutes, until the tomatoes have softened slightly. Add tomato puree, fresh basil and about a 1/2cup of water, to cover the tomatoes completelty, and bring to a boil. Reduce heat to low, cover and let simmer for about 15 minutes. Add cooked cannellini beans and an additional 1/2 cup of water and continue to simmer covered for another 15 minutes. Depending on how much liquid your tomatoes produced, you may need to add more or less water here. You need enough water to cover all the ingredients completely but you don’t want too much excess water. Remove from heat and let sit for 2-3 minutes then puree to a smooth creamy consistency using an immersion blender (or transfer to an upright blender). Add more water, in small amounts, if required, to get the desired consistency. It is best thick and creamy. If you like a more liquid soup, top it up with broth instead. Too much water will dilute the flavours. Adjust seasoning to taste and bring back to a boil. Reduce heat to low and simmer, allowing it to thicken to the desired consistency. Serve with crispy sourdough croutons. Slice sourdough bread into 1 inch thick slices, then slice each one into cubes. Place in the oven, on a parchment lined baking sheet, bake in a preheated oven at 200 C until crispy, about 12-15 minutes, watching them carefully so they don’t burn. Remove them from the oven, drizzle with extra virgin olive oil and toss to coat with oregano. This looks so good, regardless of the weather! Tomatoes are one of those things where ripeness and quality make SUCH a big difference in the flavor. Thanks so much Natalie. I find it hard to avoid tomatoes, so I just limit them. I don’t miss the potatoes too much since I’ve always been more of a sweet potato and yam fan, and those are ok. I still eat potatoes occasionally. Balance is key to life. Looks just perfect Nissrine! Simple and delicious! Totally want a bowl right now. Just printed the recipe. Thanks for the info about nightshades too…thankfully we don’t have those issues….I think I’d die without my potatoes!!! Thanks Brandi.. I actually thought of you when I was writing this because I was getting ready to make your cheese sauce after I hit publish. I made it using sweet potatoes instead and left you a comment on Instagram. Will share a pic tomorrow. It was amazing!!! Thanks Audrey, I love them too. this looks great! lovely photographs 🙂 can’t wait to make this, printing the recipe right now! Thank you so much Ridhima. We made it again this week,and it’s still tasty as ever and comes together so quickly. I hope you enjoy it as much as we did.